Pests are not the ideal find within your home. While keeping a clean house is no way to guarantee that you don’t wind up with pests, it certainly is one of the ways that you can reduce the chances of an infestation. At Earthwise Pest Management, we like to focus on the natural and safe approach that removes pests and the factors that drew them in, in the first place. That being said, natural resolutions and preventative methods are something that we appreciate. If you’re using organic cleaners like vinegar to clean the home, there are lots of essential oils that you can mix in that have been shown to reduce the chances of pests. When it comes to your cleaning, this is a great way to kill two birds with one stone. Your organic cleaner will not only smell great and leave your space cleaner, but it will help to keep the bugs at bay. Keep reading for a few essential oils that you could try mixing in with your organic cleaners or adding to your essential oil collection. 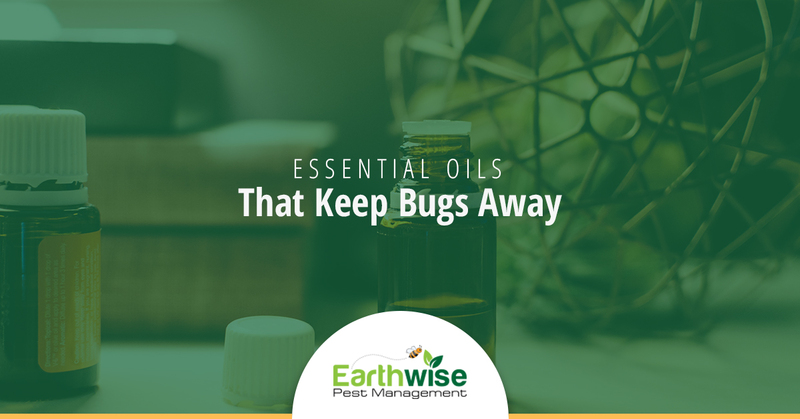 One of the most well-known essential oils that you can choose from also happens to be one of the best options for minimizing pests in your home. This relaxing scent is known for creating a tranquil space, but it’s also great for keeping pests away. Whether you choose to mix it in with cleaning supplies or you pour some into an essential oil burner, this is a scent that you can rely on. If you’re looking for a fresh scent to add to your cleaning supplies, pine is a fantastic essential oil to consider. This offers a fresh scent and lets you bring in a little bit of the outdoors to the comfort of your home. The best part of resorting to pine essential oils is that you don’t have to worry about any of the pests that live outdoors, making a home inside of yours. A common scent used in cleaning supplies is citrus. This is a scent that our minds have registered as clean, but it’s also great for keeping bugs away. If you are using something natural like vinegar or ACV to get your cleaning done, adding some citrus essential oils is a great way to keep the solution natural while adding in a fresh scent that reduces your chances of pests. This is one of the best ways to enjoy a natural solution that smells just as good as anything you’d find in the cleaning aisle. Your kitchen is the room that is most likely to wind up with a pest problem. This is a highly undesirable situation, but the good news is that thorough cleaning could help you out. Thyme is a scent that is known for being in the kitchen and, while it’s not one of the normal scents that you’d find in cleaning supplies, it should be! Thyme has a unique and comforting scent, and while it’s enjoyable for our noses, that’s far from the case for pests. While we’re on the topic of essential oil scents that are commonly found in the kitchen, let’s talk about an ingredient that is commonly used in dishes: basil. This is another scent that smells great and has a bold, recognizable scent. That’s just one of the reasons that we love adding it into our cleaning solutions. Basil essential oils are another fantastic deterrent for pests and an easy scent to incorporate into your home. We’ve talked about a few savory essential oils that can be added to cleaning supplies or added to a diffuser to help minimize the chances of pests, but for those of you looking for a more refreshing scent, peppermint is another excellent essential oil that you can use. Peppermint is great for canceling out stronger scents, freshening up a room, and relieving a little bit of stress. All of these things are great for us to incorporate into our homes, and if you love the minty scent, that’s a bonus! The fact that they keep bugs away is just the cherry on top. We touched on citrus earlier in the post, but lemon is a very particular essential oil that also adds a little extra flare to all of your cleaning supplies. With countless benefits, lemon is one of the essential oils that most people always have on hand. To us, easy access plus countless benefits seem like the perfect addition to any cleaning solution that you’re regularly using. The fact that you can use natural solutions and enjoy the same great scent is fantastic, but we love that the solution reduces pests too. Utilizing essential oils in your cleaning supplies and home is a great way to minimize the chances of pests in your home. While it can reduce the chances of pests coming into your home, there’s no sure way to keep them out. Having a professional pest control company come and inspect your home on a routine basis is one of the best ways to keep pests out. If you’re interested in scheduling routine pest control maintenance, reach out to Earthwise Pest Management. We offer full-service pest control management to the Sacramento area. From long-term treatment to preventative measures, our team can assist you with it all. Reach out to us today, and we’ll get your free consultation scheduled.